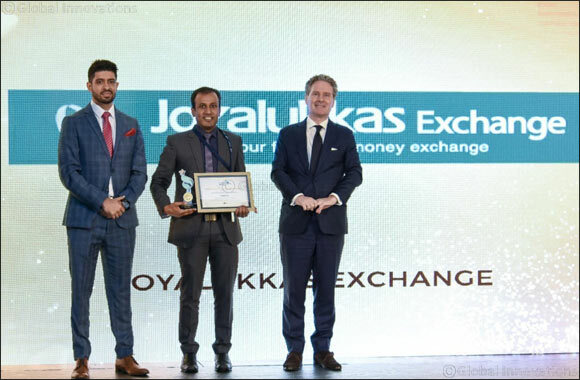 Dubai, UAE, November 06, 2018: Joyalukkas Exchanged bagged the prestigious Best Strategic Customer Loyalty Program Award – 2018 in the Middle East's Customer Happiness Summit and Awards. On behalf of Joyalukkas Exchange, Mr. Marish Karna, Manager - Business Process, received the award from Mr. Hans Sandee, Netherlands' Consul General in Dubai. The event took place at H Hotel, Dubai on 18th October 2018. Joyalukkas Exchange provides its customers with a world-class experience in foreign exchange and cross-border remittances. The company's innovative services are powered by a strong and reliable network built by a diligent team of proficient professionals who ensure that customers receive the best at all times and under any given circumstances.